DE ROSSI - [The Parma Duchy]. DE ROSSI, G. - [The Parma Duchy]. [The Parma Duchy]. - DE ROSSI, G.
Title : [The Parma Duchy].. Date : Rome, ca. 1692. Size : 21.5 x 16.5 inches. / 54.5 x 42.0 cm. 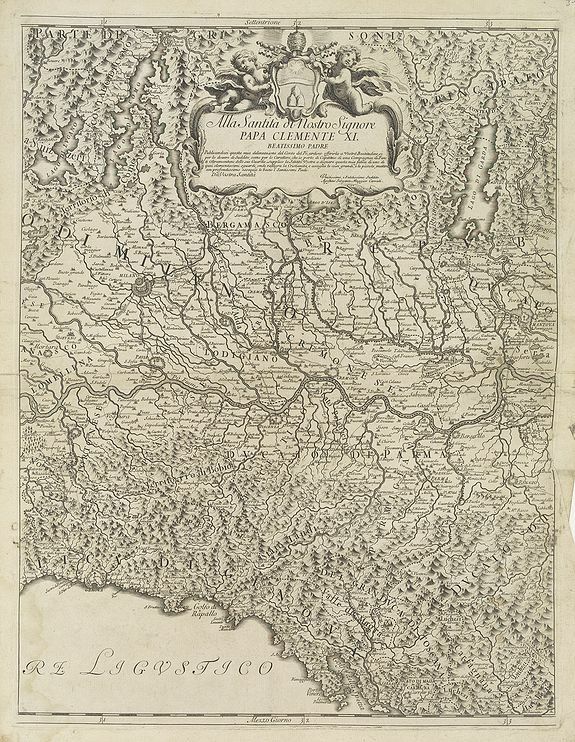 Description :A uncommon late 17th century map of part of the Parma Duchy in Italy, based on the reports of Giacomo Cantelli da Vignola and published in Roma in Giacomo de Rossi's world atlas "Mercurio Geografico". In upper center a dedication cartouche "Alla Santita di Nostro Signore Papa Clemente XI Beatissimo Padre." The Duchy of Parma was created in 1545 from that part of the Duchy of Milan south of the Po River. Including Milan, and Lake Garda in the upper right corner. The Italian cartographer Cantelli introduced a style in cartography that was followed and developed by Coronelli. Condition : Paper age-toned. Else a good and dark impression.